What Day Of The Week Is April 27? 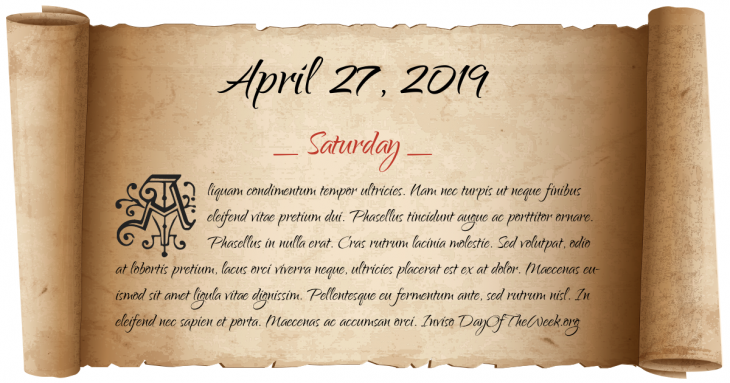 April 27, 2019 is the 117th day of the year 2019 in the Gregorian calendar. There are 248 days remaining until the end of the year. The day of the week is Saturday. Emperor Arcadius marries Aelia Eudoxia, daughter of the Frankish general Flavius Bauto. She becomes one of the more powerful Roman empresses of Late Antiquity. First performance of Handel’s Music for the Royal Fireworks in Green Park, London. President of the United States Abraham Lincoln suspends the writ of habeas corpus. World War II: German troops are finally expelled from Finnish Lapland. Expo 67 officially opens in Montreal, Canada with a large opening ceremony broadcast around the world. It opens to the public the next day. The U.S. Department of Justice bars the Austrian President Kurt Waldheim from entering the United States, saying he had aided in the deportation and execution of thousands of Jews and others as a German Army officer during World War II. South African general election, 1994: The first democratic general election in South Africa, in which black citizens could vote. The Interim Constitution comes into force. Who were born on April 27?